This composite image was assembled from 24 individual exposures taken with the NASA Hubble Space TelescopeÕs Wide Field and Planetary Camera 2 in October 1999, January 2000, and December 2000. It is one of the largest images taken by Hubble and is the highest resolution image ever made of the entire Crab Nebula. The supernova which produced the Crab Nebula was observed by the Chinese in 1054 AD. It is positioned in the constellation Taurus and is about 2 kiloparsecs away from Earth. Chaisson & McMillan quote the distance at 1800 pc with an extent of about 2 pc. The nebula has been a rich source of information. It contains the fastest known pulsar at 0.033 seconds period. The discovery of the optical and RF signals from the same source was important in that it gave a probe of the number of free electrons in space between us and the pulsar. 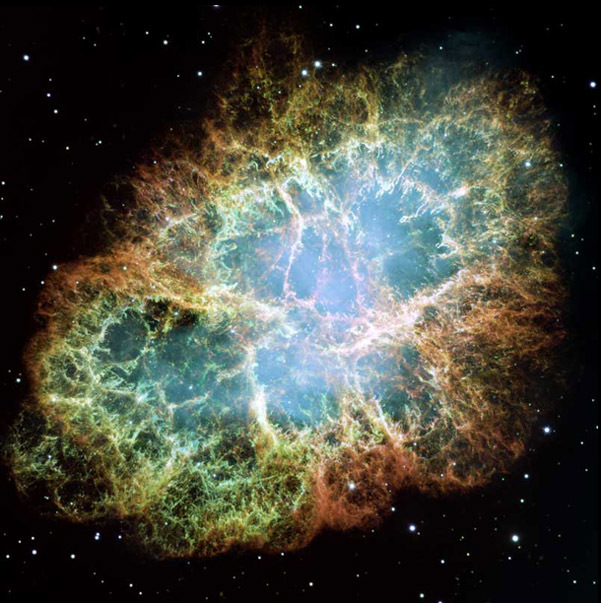 The dispersion,or slowing of the RF compared to the visible gave the figure of about 1 electron per 30 cm3, using the distance to the Crab Nebula obtained by other methods. The Crab pulsar is slowing at the rate of about 10-8 sec per day, and the corresponding energy loss agrees well with the energy needed to keep the nebula luminous. Some of this luminosity takes the form of synchrotron radiation, requiring a source of energy for accelerating charged particles. When moving charges spiral in a magnetic field, they produce radiation as a result of their accelerations which is called synchrotron radiation. The phenomenon is named after the General Electric Synchrotron, an accelerator which used magnetic fields to contain electrons which had been accelerated to high energies. 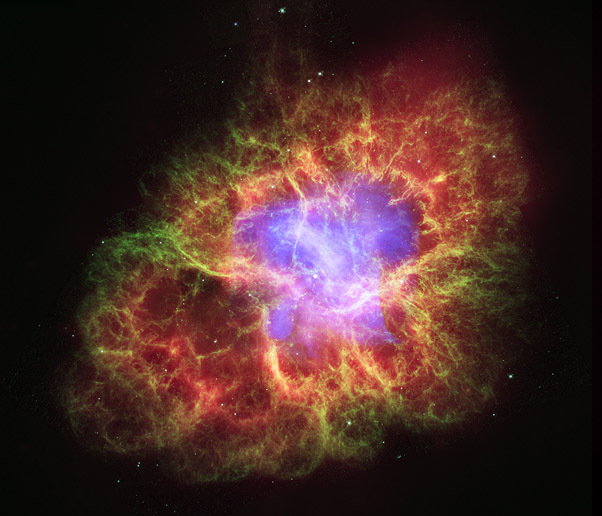 Such radiation is observed in astronomical sources, such as the Crab Nebula. Its signature is that it does not follow the blackbody radiation curve, increasing toward lower frequencies rather than toward high (it is said to be "nonthermal"). It also shows characteristic polarization in the plane perpendicular to the magnetic field about which the charges are spiraling. Because the spiraling charges are emitting energy, they will be slowing down and emitting at lower frequencies. When high frequency synchrotron radiation is observed steadily from astronomical sources, it implies that there is a source of energy of some kind to feed the process. The discovery of Supernova 1987A was a great opportunity for detailed observation of the dynamics of a supernova. This supernova was unusual in that it did not rise abruptly to its maximum brightness, but paused briefly before increasing its luminosity by another factor of ten. It increased for about 85 days and then began a gradual decline which was more characteristic of other observed supernovae. Another unique feature about this supernova is that the star which exploded had been observed and named Sk-69202. It was a blue supergiant presumed to have a mass of about 20 solar masses. Almost coincident with the observation of the supernova, a burst of neutrinos were observed on the Earth, providing further information for modeling supernovae and providing another test for the mass of the neutrino.